As the country enters into the 2012 presidential election cycle, the electorate’s partisan affiliations have shifted significantly since Barack Obama won office nearly three years ago. In particular, the Democrats hold a much narrower edge than they did in 2008, particularly when the partisan leanings of independents are taken into account. 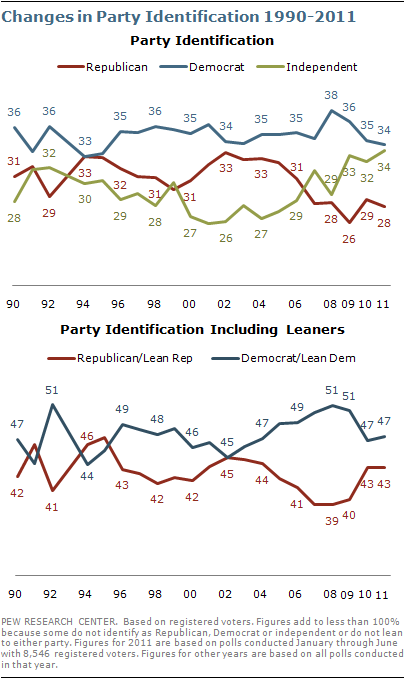 Analysis of the overall balance of partisan identification in all Pew Research Center polling conducted in each year – updated with data from the first six months of 2011 –finds that as the number of Democrats has fallen from a quarter-century high in 2008, the number of self-proclaimed independents has continued to grow. As a result, there are now as many independent voters as Democrats (34% each) – the first time this has occurred in more than two decades of Pew Research Center surveys, and, by all indications, the highest percent independent since party identification was first measured in the late 1930s. 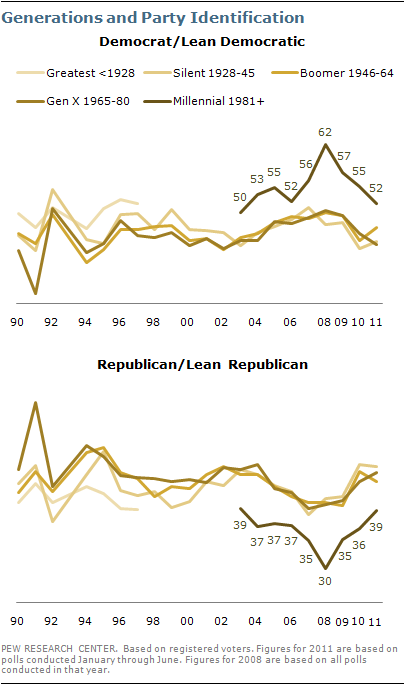 While the number identifying as Republicans has remained relatively flat (28% in both 2008 and 2011), more independent voters lean to the GOP than did so in 2008 (16% now, 11% then). When leaners are combined with partisans, Democrats only have a four-point advantage among registered voters – 47% of voters are Democrats or lean to the Democratic Party while 43% are Republicans or lean to the GOP. In 2008, Democrats held a 12 point advantage over Republicans (51% to 39%). Republicans have made sizable gains among white voters since 2008. Currently, 52% of white voters either identify as Republicans or lean to the GOP, compared with 39% who affiliate with the Democratic Party or lean Democratic. In 2008, Republicans held only a two-point lead among white voters (46% to 44%). There has been no change in party identification among African American or Hispanic voters. Large majorities of African American (86%) and Hispanic voters (64%) continue to identify as Democrats or lean Democratic. The Democratic Party’s advantage among young voters has declined from 28 points in 2008 to 13 in the first half of 2011. The Democrats’ edge among voters ages 30 to 64 also has narrowed (from 10 points to three points). And Republicans now hold a two-point lead among voters 65 and older (47% to 45%); Democrats held an eight-point lead among seniors in 2008 (49% to 41%). Republican gains have been substantial among voters with family incomes under $75,000. Notably, Democrats held a 12-point advantage among middle income voters ($30,000-$74,999) in 2008, but now as many identify with the Republican Party as with the Democratic Party. Democrats continue to maintain their advantage among lower income voters, but it is smaller now than in 2008. The Republican Party’s wide lead among white voters is not unprecedented. 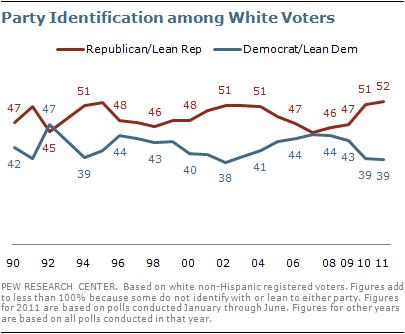 The current 12-point advantage in leaned party affiliation among whites is on par with the GOPs lead among whites from 2002-2004 and in 1994. And as with the national trend, there has been virtually no shift in partisanship among whites from 2010 to the first half of 2011. Unlike 2008, Republicans now have the advantage across virtually all groups of white voters. Most notably, Republicans now have an 11-point lead over Democrats (52% to 41%) among whites under the age of 30. In 2008, Democrats held a seven-point edge among this group (49% to 42%). While the GOP’s gains have been particularly evident among young whites, they have picked up support across all age groups as well. Among white voters ages 30 to 49, the Republican lead over Democrats has grown from seven points to 19 points. Among voters ages 50 to 64, who were evenly split in 2008, Republicans now have a nine-point advantage. The GOP’ had a slight 2-point edge among white voters 65 and older three years ago; that has increased to 12 points in the first half of 2011. Republicans also have widened their advantage among white men from 11 points in 2008 to 21 points now. Republicans now have a five-point lead among white women; in 2008 Democrats had a seven-point lead over Republicans among white women voters. Democrats have lost their edge among lower income white voters. In 2008, Democrats had a 15 point lead among white voters with family incomes less than $30,000. Republicans now have a four-point edge among this group. The GOP’s lead among middle income white voters also has grown since 2008, and Republicans maintain a substantial advantage with higher income white voters. Republicans have made gains among whites with a high school education or less. The GOP’s advantage over Democrats has grown from one point in 2008 to 17 points in 2011 among less educated whites. Republicans have made smaller gains among whites voters who have college degrees. The Millennial generation – those born after 1980 – were a topic of much discussion in the 2008 election. These young voters – the oldest turned 27 that year, and are turning 30 now – leaned Democratic by roughly two-to-one in the 2008 election, and their commitment to Barack Obama, and relatively high voter turnout, was a substantial factor in the election’s outcome. While these voters remain the most Democratically oriented generation today, the advantage has narrowed substantially since 2008. Currently, 52% of Millennial voters are Democrats or lean to the Democratic Party while 39% are Republicans or lean to the GOP. This 13-point edge is less than half the size of the 32-point edge Democrats held three years ago. Among voters in other generations, Democrats have lost adherents while Republicans have gained. But these changes have not been as large as those among Millennials.